Three short plays by Christine Toy Johnson, Do These Genes Make Me Look Fat, Ever See a Fat Chinese and Halo Halo Birthday, along with “Hawaii is the Place for You and Me”, a song she wrote with David A. Shenton, will be featured in a multidisciplinary art exhibition Eating Cultures at SOMArts Cultural Center, 934 Brannan Street in San Francisco, May 1, 2014 through May 30, 2014. Featuring over thirty emerging and established Asian Pacific American artists from around the country, Eating Cultures is a deliciously provocative multi-disciplinary arts exhibition of artworks inspired by Asian American food and foodways. Using food as a lens, artist share stories of global migration, adaptation, entrepreneurship, and the central importance of food in Asian communities around the world. 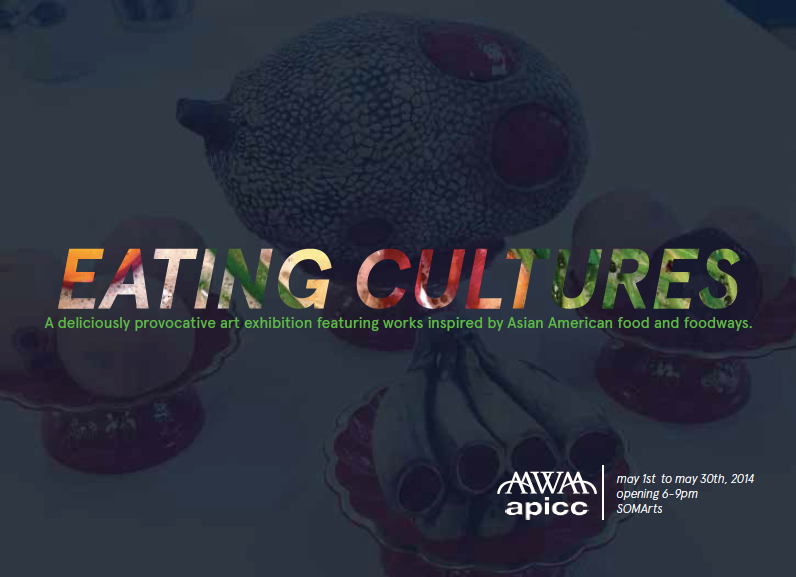 Eating Cultures, co-sponsored by Asian American Women Artist Association (AAWAA) and Asian Pacific Islander Cultural Center (APICC), is part of the annual “United States of Asian America” festival. In addition to over fifty art, film, and literary works, Eating Cultures will feature Asian American oral histories provided by Southern Foodways Alliance via Guide by Cell, dynamic programming co-presented by Asia Society and the Culinary Historians of Northern California, a pop-up shop, and a recipe wall for audiences to share their favorite family recipes. Eating Cultures is curated by lead curator Michelle A. Lee and co-curators Linda Inson Choy and Cynthia Tom, featuring APA artists of all genders selected by esteemed juror University of Connecticut Art History & Asian American Studies Professor Margo L. Machida. Invited artists include Chinese-American San Francisco-based painter and sculptor Cathy Lu, Vietnamese-Irish American Los Angeles-based artist Genevieve Erin O’Brien, and Korean-American Berlin-based artist Kate Hers Rhee. When: Exhibition May 1–May 30, 2014. Opening event Thursday, May 1, 6–9pm. Gallery hours: Tues–Fri, 12-7pm and Sat, 12–5pm. 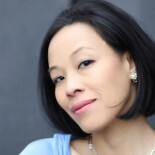 The Asian American Women Artists Association (AAWAA) is a national non-profit arts organization dedicated to ensuring the visibility and documentation of Asian American women in the arts. Since 1989, AAWAA has been a resource for the arts and academic communities, working to further the recognition of Asian American women artists. Through exhibitions, literary readings, speakers’ bureau, publications, and educational programs, AAWAA offers thought-provoking perspectives that challenge societal assumptions and promote dialogue across cultures and generations. For more information on AAWAA and its mission and programs, please visit www.aawaa.net. Contact AAWAA at 1890 Bryant Street, Suite 302, San Francisco, CA 94110, (415) 252-7996, info@aawaa.net. The Asian Pacific Islander Cultural Center’s (APICC) mission is to support and produce multi-disciplinary art reflective of the unique experiences of Asian Pacific Islanders living in the United States. Since 1998, the Center has promoted the artistic and organizational growth of the City’s Asian/Pacific arts community by organizing and presenting the annual United States of Asian America Festival. For more information on APICC and its mission and programs, please visit http://www.apiculturalcenter.org. Contact APICC at 934 Brannan Street, San Francisco, CA 94103, (415) 829-9467, info@apiculturalcenter.org. The exhibition is funded in part by the California Arts Council, the San Francisco Arts Commission, National Endowment for the Arts, APICC, the Robert J. Louie Memorial Fund, and Zellerbach Family Foundation, and is presented at SOMArts through participation in the Affordable Space Program, which provides below-market rental space, production and publicity assistance to nonprofit organizations. For more information visit our rentals page. This entry was posted on May 1, 2014 by Lia Chang in Asian American Artists, Asian American Issues, Chinese American History, Entertainment, Events, Food, Japanese American History and tagged "Hawaii is the Place for You and Me", Aaron Henderson & Grace Umali, Alana Lowe, Alison Ho, APA artists, Asia Society, Asian American food, Asian American oral histories, Asian American Women Artist Association (AAWAA), Asian Pacific American artists, Asian Pacific Islander Cultural Center, Backstage Pass with Lia Chang, Cathy Lu, Chee Wang Ng, Christine Toy Johnson, Culinary Historians of Northern California, Cynthia Tom, David A. Shenton, Do These Genes Make Me Look Fat, Eating Cultures, Ever See a Fat Chinese, Flora Choi, Frances Kai-Hwa Wang, Genevieve Erin O’Brien, Grace Jahng Lee, Guide by Cell, Halo Halo Birthday, Jessica Redmond, Jessica Tang, Juliana Kang Robinson, Jung Ran Bae, Ka Yan Cheung, Karen Chew, Kate Hers Rhee, Kay Cuajunco, Larry Lee & Jason Dunda, Leslie Zeitler, Lia Chang, Linda Inson Choy, Maggie Wong, Margaret Rhee, Margo L. Machida, Melissa Chow, Michael Watson, Michelle A. Lee, Michiko Murakami, Mieko Meguro, Mitsuko Brooks, multidisciplinary art exhibition, Pallavi Sharma, Samantha Chundur, Sara Zin, Shizue Seigel, Sigi Arnejo, SOMArts Cultural Center, Southern Foodways Alliance, Susan Almazol, Theresa Loong, United States of Asian America festival, University of Connecticut Art History Professor, University of Connecticut Asian American Studies Professor, Yoshie Sakai, Zilka Joseph.